How amazing is this dining room?! This Long Island beach house, decorated by Manhattan designer Timothy Whealon, was featured in Veranda's May/June issue. Where do I begin with what I'm loving in this space? Let's see...the soft gray wall color and crisp white paneling create a cozy feeling and give the illusion of a high ceiling. The dark wood floor anchors the entire space and allows all of the white and linen accents to really pop. 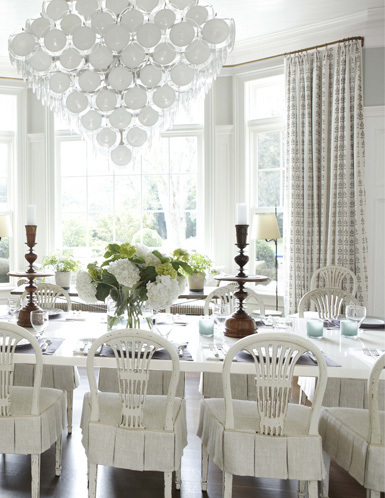 I adore the sleek white lacquered dining table paired with the traditional side chairs in a worn white finish. The over-sized upholstered host & hostess wing back chairs create a grand feeling - this is something I love doing in client's dining rooms. And that chandelier?! I think it's what "makes" this entire space! What else do you love about this dreamy dining room? I think you hit on everything grand about this dining room. The chandelier and architecture (molding, paneling, windows) are my favorites. Love this dining room as well! I love that they used wingback chairs for the end chairs. Such a unique touch! While I dont care for the artwork or the chandelier (sorry) I do love the mix of rough and smooth and the cozy slipcovered seats and wing chairs at the dining room table. Beautiful setting! Especially love the textural contrasts, the height of the beautiful panelling and your infusions of warm wood tones, brass hardware.